What is the minimum length of time I can book a MoDal? The minimum length of time you can book a Dalmatian model for is for 2 hours. How much does it cost to hire a MoDal? All of the MoDals rates are charged by the hour or part there of. Rates are determined by how long and how many MoDals you require as well as location. Please Contact Us directly to discuss pricing and rates. How do I know if the MoDals will be available on the dates I require? You can discover if the MoDals are available for hire by viewing our booking calendar on the Book A Dalmatian Model page. Alternatively you can contact us direct via our Contact Us page. Can I book more than one Dalmatian Model for my event? Yes you can, in fact you will receive a 50% discount on all subsequent Modals that you hire for the same appointment (eg: 1st model – full price, 2nd and 3rd etc would be 50% off). What payment options does MoDals accept? You can pay Modals in cash or via Direct Debit to our bank account. What types of Modelling situations and events can the MoDals perform at? MoDals have experience working with professional camera crews right through to children’s birthday parties. We have listed events below we are able to do (but are not limited to). Does MoDals have any Dalmatian puppy models? Due to MoDals association with CCDalmatians (Champion breeders of Dalmatians) we do have litters of puppies from time to time. We are also able to provide Dalmatian models with differing ages from puppies through to adulthood. Should you specifically require Dalmatian puppy models or younger dog models it is best to Contact Us to discuss your needs further. Does MoDals have both black and liver spotted Dalmatians models available? Yes we certainly do. Please view The Models individual profiles to learn more about each MoDal including their color types. Can the MoDals wear costumes we supply? The MoDals and their handlers are happy to accommodate any reasonable modelling request and dressing up in costumes is certainly one of them. Although the MoDal handlers are experienced trainers please do bear in mind the suitability of any costume you are supplying and that you may have a limited window of time to get the shot. Can I become a MoDals model or handler? 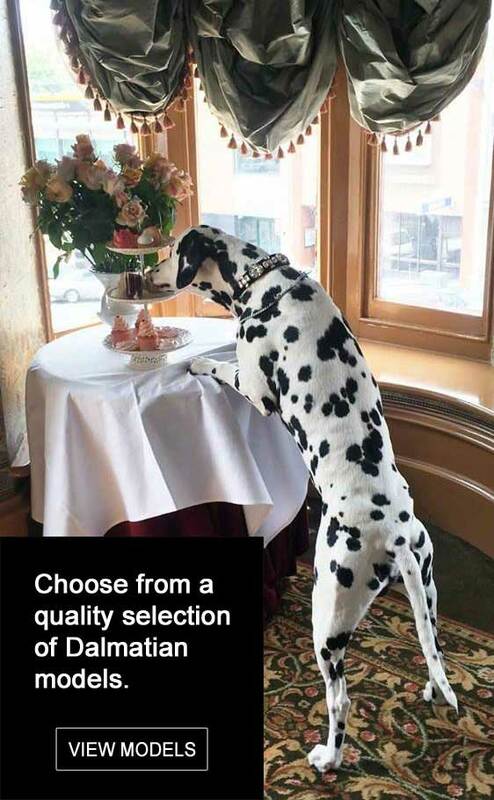 The MoDals are carefully bred, reared, exhibited and trained by CCDalmatians (Champion breeders of Dalmatians). As such generally only a CCDalmatian bred/owned dog can become a MoDal. From time to time we do however refer modelling work to a scrutinized list of other accredited Dalmatian pet models and their handlers. Should you wish to be considered for this list please Contact Us to discuss this further. Can Modals operate or travel interstate? Yes, Modals are able to travel interstate upon request. Standard model rates apply as well as travel and accommodation expenses. Please Contact Us directly to discuss rates and travelling expenses. Modals may also be able to source affiliated Dalmatian models interstate if required.